Discover yourself in a new way. Change your thinking and be the best person you can possibly be. Create millionaire mindset and learn secrets of the millionaire mind. - You can live your life like average people -Go to school, get good academic education, find a good-paying job, work hard every day and live from paycheck to paycheck, create a family and die..
Or you can live your life like wealthy and successful people - Explore life every day, read books, be street smart, make money work for you, get rich, enjoy every day with your family and friends, live every second of your life without worrying about money, and create something historical and become inspiration for someone else. 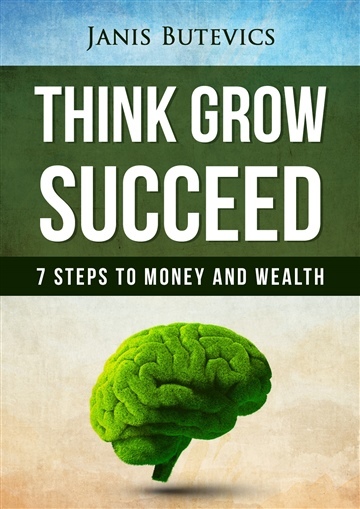 Think Grow Succeed: 7 Steps to Wealth and Money by Janis Butevics is an insightful book that will take readers on a road to self-discovery where their thinking patterns will bring about a positive change in their outlook and daily living. The seven steps discussed will help readers not only to gain knowledge, but also discover themselves in an entirely new way. The techniques will help readers transcend the barriers they have created within themselves and become successful. The book also highlights the importance of change and how it can bring new people and new opportunities into one's life.It's a motivational book that will help readers to try out new things and perceive life with brighter hues and shades. The author's views on money are thought-provoking and will make readers think about them. The affirmations given to attract money and positive thinking are also useful in creating positive vibes regarding the topic of money, and also to make the mind stronger and more confident. The tips, advice and techniques shared by the author are simple, easy to comprehend, and can be incorporated easily into one's life. This book will make readers ponder and will also make their hearts beat faster and make them come alive, to give them the confidence to do what they love and become their own life creator instead being influenced by the suggestions of other people. I really enjoyed reading Janis Butevic's ebook Think Grow Succeed: 7 Steps To Money and Wealth. It's a well written book that gives a lot of value to its readers. Janis captures the attention of the reader right from the beginning when he challenges their mindset about money and wealth. He then continues to make the point in the book that it's all about the mindset that will determine your success with money. Each of the 7 steps outlined in the book are very practical and simple to follow. I was especially glad to read the chapter in the book about giving back and helping others. The points that Janis makes in this chapter are all so true. It was so inspiring to read about someone who values this often forgotten hidden secret of success, especially since it's such an important value to my business. I recommend everyone to read and to live out the 7 steps found in this book. They really do have the potential to change your life. I can't wait for the next book from this author. A big thumbs up to Janis Butevics!